Today we’re excited to expand social media marketers’ workflow using SEMrush suite, and save you time with the help of one tool — Social Media Poster. You can now schedule and post articles on LinkedIn, the world’s largest professional network with over 530 million members, and easily reach an audience of professionals in your field. Using our tool, posting on LinkedIn is as simple as posting on Twitter or Facebook. First, go to your project, or create a new one, and head to Social Media Poster. Next, connect your LinkedIn account – either your personal profile or your company page. Once you’ve completed this step, we encourage you to create your first post on LinkedIn! In order to do that, click on the ‘New Post’ button on the left. You can add an image by uploading it from your computer or by simply inserting a link to the image. Finally, add your post to your publishing queue, schedule it for later, post it immediately or save it as a draft. Important! To post on LinkedIn using the tool, you must have a paid SEMrush subscription. 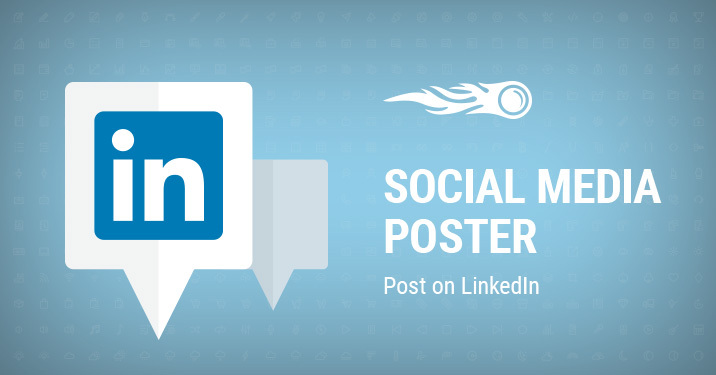 If you’re new to Social Media Poster, explore the possibilities it offers you. Should you have any feedback or thoughts on how to improve the tool, get in touch with us by dropping us a message at [email protected]. And as always, stay tuned, as more updates are coming! Display Advertising: New Countries, Integration with SEOquake and More!